After a few days of rest, the band was ready to get back into the studio and record Darrells bass overdubs! Quinton, Tanner and I joined Darrell for his 11am start time - since he had to work at 3pm today, he wanted to have plenty of time to completely finish the bass overdubbing. Quinton used this time to digitally edit the awesome new logo that Darrell had drawn up the other day - and I used this time to write, while Tanner kept us company. The tracks were sounding so good; which is pretty cool since I didn't realize they could get any better. Lloyd was doing such a great job of keeping the songs true to what they were meant to be; all while making sure they came across nice and clean in the recordings - he also taught us about something called a strobe tuner; which the guys quickly decided they needed to invest in once they realized the level of accuracy it had. Two hours flew by and Darrells bass parts were nearly complete. It’s been really interesting to sit in the control room throughout (most of) this whole process. While sitting in the background I have learned a great deal about all the differences between live shows and in-studio recording. Small things that can actually make such a huge difference - things that most people wouldn’t even notice if they weren’t directly brought to your attention. I can easily say it’s been a learning experience for everyone; including myself - and luckily Lloyd has been a fantastic teacher. Sarah joined us at the studio in the midst of Darrell recording the last track. Once his bass parts were finished it would be time for Sarah and Quinton to do any last minute retouches on the vocal tracks so that the final recordings can be mastered! By 2pm Darrell, Lloyd and the rest of the band were quite pleased with what had been accomplished and they were ready to move on to vocals! Darrell was feeling so amped by the end, that he started pacing around the studio at a slow sprint - and once he finally tried to sit down, he had to get back up again to walk off some of the energy that wanted to burst out of him. 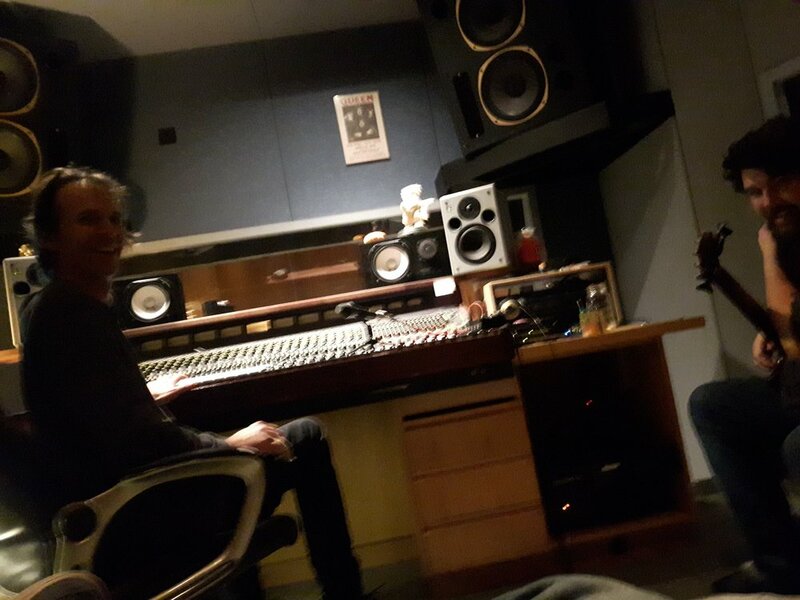 With Sarah now at the studio - and Darrells bass overdubs complete - it was time for vocals! While Lloyd tested the levels of her microphone; he said what I was thinking - Sarah had a beautiful smokiness to her voice. I think the couple days of rest - after a handful of consecutive days in the studio and a show - had allowed everyone to get the rest that we so badly needed. After a quick drive to get Darrell to work on time; Tanner and I returned to the studio just in time to catch Quintons third and final recording of the vocals for Procrastination. The first two takes he recorded were done without being able to hear the vocals Sarah had done earlier - and the last take was recorded with Sarahs voice playing in his headphones. All three takes were great and everyone in the room agreed that the vocals were now complete. Tate had a few small things he wanted to redo before the final cuts were made so he headed into the recording room to get his guitar set up for recording. After a quick run through of the solo bits he wanted to adjust; he was pleased with the final takes of his guitar - and so was everyone else. The fifth day of recording was now complete and everything was coming together so beautifully! It was such a great day in the studio - the perfect way to wrap up House Handshake’s first-ever recording experience. Before snapping a quick photo; the band members thanked Lloyd - and Lloyd thanked them - and we each took turns getting a hug before leaving the studio for the last time. The tracks had to be cut and mastered and these were processes that didn’t require the band be in the studio. Leaving the tracks in Lloyds capable hands was easy for the band because, like I’ve said since the beginning of this blog, the band trusts him and he is quite fantastic at what he does. It'll be exciting to write something for you to read once the band and I have had a chance to hear the mastered tracks. Once I’ve had the chance to watch the band members reactions to listen to each finished, mastered song. For now, it was time to play the sit and wait game - but we were ready.